I love long weekends. You may think that is a silly statement, but it’s not, one of my coworkers actually does not like them because he gets bored. Crazy, eh? My weekend was anything but boring. It started with cousins dinner Friday night. We went for tapas at Sala Rosa and had a delicious meal. I will soon be attempting to replicate the fried goat cheese with honey and onion confit. And if I’m feeling adventurous I may even attempt the mussels with bacon and cream sauce. Some friends from Ottawa came into town Saturday to watch the hockey game, which the Habs sadly lost (the Habs are also losing as I write this, my theory is if I pay less attention they might tie the game). Sunday we had a lovely picnic on the mountain. I would have written about the food we ate, but we gobbled it up so fast I wasn’t able to get any pictures. Needless to say, we overindulged a little. 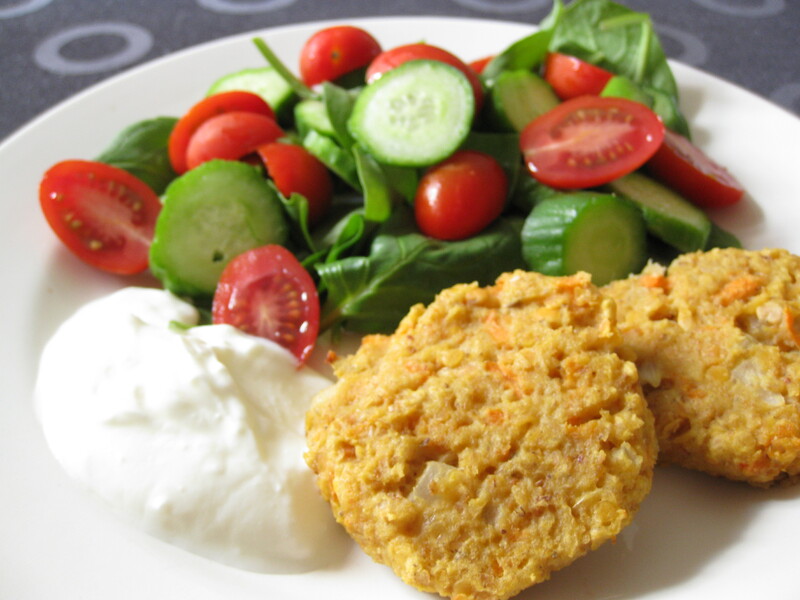 To make up for those indulgences, I decided to make myself a nice healthy lunch today, red lentil patties. In a saucepan, cover the lentils with water by about two inches. Bring to a boil, then simmer for 10 minutes. Drain lentils. While the lentils are cooking, fry the onion and garlic. In a large bowl, combine lentils, onion mixture and all other ingredient. Form the mixture into burgers. Put the patties on a greased baking sheet and broil 4-5 minutes on each side. The patties were very tasty, and were quick and easy t o make. I had them with plain yogurt, but they would have been great with something like tzaziki. Next > Have Some Chocolate. These look like a good excuse to eat some sour cream! yummy, yummy, yummy. I wish that you brought me leftovers….